They thaught us how to make bread, and just when we were ready to do our own pasta madre tripping performance live with an audience, they had to leave again, just before the real fun was starting. "Coitus interruptus" they called it. We were at Damoclash, an Amsterdam based free culture festival (with pizza's for 7 euro) and we were about to give away 15 kilo of bread, but who was gonna make all that bread? 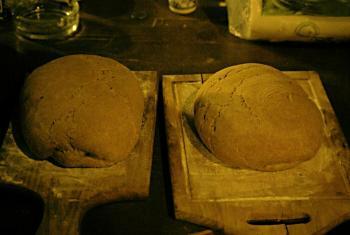 Learn how to make people-bread: bread made by you, your hands and an oven. 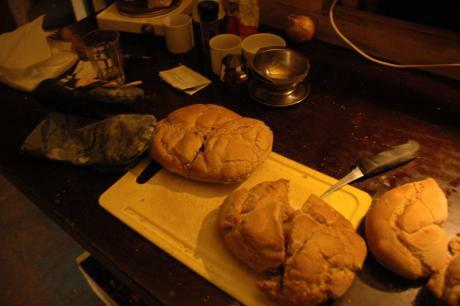 a traveling circus of 2 south-italians spreading the joy of bread around Europe. Traveling with *sourdough for bread*, they extend the sharing of bread day by day with their Pasta Madre (mother sponge) while new sourdough is extended through mixing with the existing one. Through spreading the joy of sourdough bread they create new connections between people and our food cultures. I would happily participate in more activities in terms of, for example, doing useful things around.